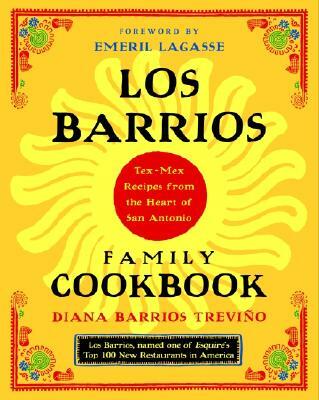 Diana Barrios Treviño and her brother, Louie Barrios, own and operate Los Barrios restaurant, which The New York Times praised as one of the top restaurants in the San Antonio area (although locals have known that for years). She regularly champions Tex-Mex cooking on the Today show, and has appeared on Good Morning America and FoodNation with Bobby Flay. I’m always looking for new tastes and cuisines in different regions of the country, especially those that involve local culture. We went in search of big Tex-Mex cooking, which San Antonio is known for. I chose Los Barrios from the many Tex-Mex restaurants in the city because I fell in love with Diana Barrios Treviño and the entire Barrios family. . . . The dishes they have created contain amazing combinations and flavors that many people don’t get to experience. I wanted the rest of the country to sample what I was tasting. I wanted people to realize that true Tex-Mex cooking isn’t just fajitas and burritos. Now, with the Los Barrios Family Cookbook, I am excited to know that people across the country can easily prepare and taste all of the delicious dishes I experienced on my visit. Whether you like your food hot, medium, or mild—and these recipes have it all—you’ll love the food in this book.